When it comes to cleaning, I’m not exactly what you would call “very good at doing a lot.” Those are my wife’s words, and not mine. So when Rug Doctor got in touch offering to send out their Portable Spot Cleaner – as well as few other products – to help clean the stains from those muddy autumn walks, my wife almost tore my arm off in excitement. Not only was she going to be able to have the rugs cleaned, but I was going to have to do it. I think that’s what you call a win win. The main thing that comes to mind when you think of Rug Doctor is likely their big bulky machine. It’s the machine you can usually rent from supermarkets and generally has a much more professional feel to it. But what Rug Doctor have done is condense that professional machine into something much more portable and far more convenient to use. This machine isn’t exactly ideal if you have a very large area to clean, but for the odd stain dotted around the carpet, or even your rugs, it really is ideal. I understand that the Rug Doctor Portable Spot Cleaner isn’t something that is going to have a massive appeal to a large number of people. Retailing at £150 this just isn’t going to be for everyone. If you’re serious about your cleaning then I would highly recommend it. All in all, this is a fantastic machine to use if you really want to give your rugs or carpet a very deep clean. It’s pretty foolproof in how easy it is to use and you only have to look at the water by the end of it to see how effective it really is. 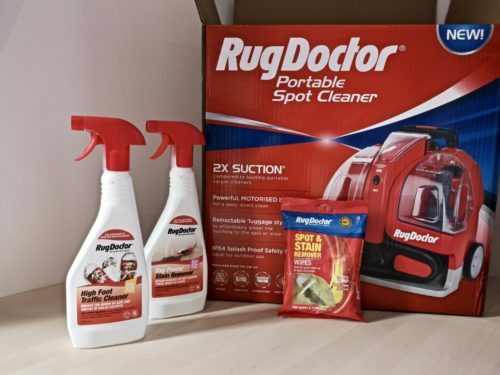 If you don’t want to splash out and give your carpets a really good deep clean, then Rug Doctor have plenty of other products on the market that also do a rather good job. Altogether we’ve been using the High Foot Traffic Cleaner, the Oxy Power Stain Remover and the Spot and Stain Wipes. Now that we’re entering the autumn period muddy foot prints are going to get a lot more regular. Especially if people don’t like taking their shoes off when they come in your house. So having something like the high foot traffic cleaner is going to come in handy. We conveniently allowed our toddler to play out in the mud before letting her to walk right across the rug. I then got to work using get the high foot traffic cleaner and it worked rather well. I will admit that it does say that this is a pre-treatment to the Rug Doctor machine, but I used it without the aid of the machine to get these results. Suffice to say, it works just fine without using the spot cleaner. This is something you might want to use if you’ve had a bit of a rough night and split a good amount of wine and curry. It’s very easy to use and is actually a rather lazy product if you fancy skipping on doing a lot of the elbow grease. You just shake and spray and leave it to sink into the stain for a few minutes. Come back and then start rubbing the stain out with a damp cloth. These are basically baby wipes on steroids. If you’re anything like me then the vast majority of spills get cleaned up with baby wipes. When you become a parent baby wipes just become your go-to for almost everything. You tend to have enough lying around that you may as well use them. But these are a lot more effective at tackling stains than baby wipes are. I will admit that I prefer the oxy power stain remover as the bottle does most of the work for you. But these aren’t a bad alternative. You can check out all that Rug Doctor has on offer via their online store. Alternatively, their cleaning range can be picked up in most major supermarkets and other online retailers.